On January 11, a Monday, I heard about David Bowie’s passing. He had shuffled off this mortal coil the prior day. I was shocked by the news, though I’d hardly have described myself as a devout Bowie fan. As that Monday morning segued into afternoon, I couldn’t get Bowie out of my mind. Neither could my wife Sandy, who is far less of a Bowie devotee than I am. We were drawn, as if by an invisible force, to WXPN, the Philadelphia area’s most astute music radio station. In tribute to the great man they were playing Bowie music exclusively for much of the day. We listened for two or three hours, and when XPN turned to other programming at 7 PM Sandy and I put on WPRB, the Princeton University station, to see if Bowie reigned there. He did, and we listened to his songs for several hours more. I can’t think of many artists who, following their deaths, would receive radio homages of this sort. And of course the Bowie outpourings weren’t limited to radio. 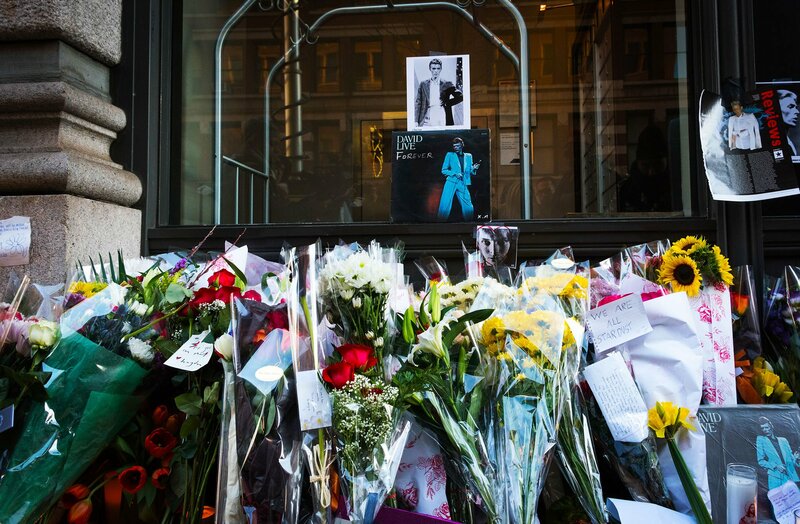 Media coverage of his life and death has been enormous and heartfelt worldwide. Naively I suppose, I’ve been amazed by the degree of attention that Bowie, in death, has attracted. I’ve been very glad to learn that countless journalists and media commentators held him in really high esteem, not to mention legions of fans. On January 11 Bowie was a top global story, probably the top story, in newspapers, on television and throughout cyberspace. And I’m struck by the extent that Bowie’s death has touched me. My reaction took me by surprise, wasn’t something I’d have predicted. I don’t know the last time a celebrity’s demise hit me so strongly. Maybe it was in 1980, when John Lennon left us. Lennon was one of my heroes. Though Bowie wasn’t, I admired the heck out of him during a swath of the 1970s and always have considered him to be a cultural giant. That accounts for part of my sadness, but not for all. So, what else was it about Bowie’s death that got to me? I’ve thought about this for awhile and have come up with two main reasons. David Bowie recorded 26 studio albums. His final work, Blackstar, entered the marketplace on his 69th birthday, two days before he died. I own six of his albums. All of them are from the 1970s except for 2002’s Heathen. I love my six from the 70s. Each I believe is great, and the greatest to me is 1976’s head-spinning and majestic Station To Station. I don’t know why I stopped buying Bowie’s releases after Station To Station. I read about them, heard some tunes on the radio, but didn’t lay down any dollars again till 26 years later. Nothing new, I was just plain stupid. Here was a guy with a brilliant track record, whose albums I once had spun over and over, and nonchalantly I had abandoned his singular musical journey. It wasn’t till a few nights ago that I realized what I had missed. WXPN and WPRB played tracks from Low, Lodger, The Next Day and other albums I barely, if at all, was familiar with. The music, as I might have guessed, was fantastic. And I played Heathen on my CD player. I hadn’t listened to it in so long I didn’t recall a single number. David, I only partly knew ya’. I should have kept up. Mea culpa. Still, missing out on a lot of David Bowie’s music isn’t the end of the world. But it’s an example of not paying attention to life, of letting life pass on by without proper appreciation. And that’s a big deal. I try fairly hard to savor the moment and to do the right thing, but there’s mucho room for improvement. Bowie’s death somehow made me look at myself and my underachieving approach. Ouch. Ouch. Ouch. And Bowie’s passing did more than that. In the recesses of my mind I discovered some connective tissues that bonded me with him. You see, David Bowie was only a smattering of months older than I, and because of that I subconsciously had felt a kinship with him. And so when he died an internal link to my younger self broke and I started to contemplate the big picture even more deeply. I mulled over the kinds of thoughts that aren’t reassuring. Such as: Even if I make it for another 25 years I’m a whole lot closer to the end than to the beginning. Man, that’s a bummer. My excellent friend Jeff recently asked me if I believe that human life goes on in a spirit mode after the flesh fails. He’s a believer. I’m not. My take is that each person’s trip is confined to Planet Earth and that the trip is one-and-done. That said, on with the party. I plan to buy a bunch of David Bowie albums soon, to catch up with someone, now-departed, whom I miss. I am aware of the enormous regret about missing out on Bowie in your post. But more than that, you are now acutely aware of the passage of time—and the brevity of life. It’s a stage we all go through. You may find this hard to believe, but this becomes less and less important as you age. You get better at living in the present, and life becomes more beautiful! You have a very good outlook and attitude. I was in France when he died and BBC talked about him all day. The world was shocked and saddened by his death. Deservedly, he was immensely popular. Neil, what a moving and lovely tribute you’ve written. Thanks to a friend tipping me off, I listened to the WXPN radio tribute to Bowie the entire day in the studio. I wish I’d known to flip over to Princeton’s radio station, too!! I found myself incredibly distracted and feeling sad while difficult to work that day. I agree w/ Joyce above – I think it was the shock, as I never dreamed that one of my music heroes (and a talented artist) would be taken away quite that young. Enjoying reading your blog very much. Send my regards to Sandra, also. You know, somehow I hadn’t realized that Bowie had as many devoted fans as he did. Although I wasn’t an enormous fan of his, his death was a very sobering event for me. I was one of those kids that didn’t quite fit in and found Bowie’s music spoke to me. I like to think he encouraged me in some ways to be myself instead of trying so hard to fit in with the socially acceptable crowd. Thanks for reading my article. I know what you mean. Bowie was great and valuable in a number of ways. I found ya through nissetje. I like your blog. Glad I found ya. A fantastic post. You have articulated brilliantly what, I suspect, a great many people have been feeling since January 11. This one made my day. Thank you. Lovely tribute. Like many others, I suspect, I found myself catching up with his back catalog after his death, buying CDs of albums that were inside my head but not present in my collection. My faves? probably Hunky Dory, Heroes and Low. Must reinvestigate Station to Station following your mention. I listened to Aladdin Sane a few nights ago. It’s great. Bowie was a hugely creative and talented person. One of the greats. My husband tapped me on the shoulder while I was brushing my teeth. “Your Hero died last night.” I said, “What? ?” He continued, “David Bowie died last night.” My knees buckled and I fell to the floor. It’s been 3 years now, and I still have not gotten up. I fell in love with David in the 8th grade. I’ll be 60 this year. Anyway, thank you for your blog. I miss him every day, in every way. Hi Debbie. Recently there was a Bowie tribute concert in Philadelphia (I live near Philly), and there probably were similar shows in many areas. . Loads of people miss him. He was terrific.